What is Avena Sativa Complex? 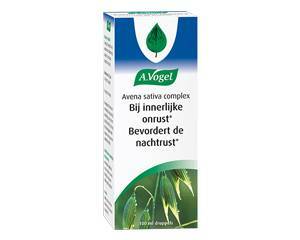 Avena Sativa Complex is a homeopathic remedy without therapeutic indications. Avena Sativa Complex contains the active ingredients Avena sativa, Panax ginseng, Ignatia amara and alcohol. Avena Sativa Complex is available in 50 ml and 100 ml bottles. Take 20 drops of Avena Sativa Complex with water, three times a day, preferably 30 minutes before eating. Wait a few seconds before you swallow. If necessary, you can take another 20 drops before bedtime. Avena Sativa Complex drops are also suitable for children. The recommended dose for children aged 6 to 12 years is 10 drops, three times a day.